By Jingo! Let’s have another war! 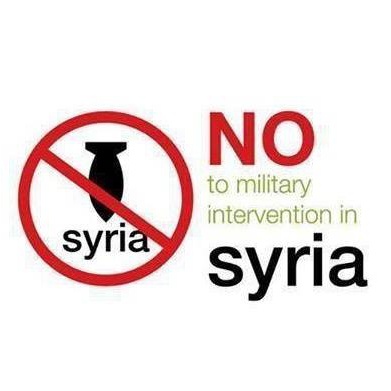 Over the last few days the Western media (well, Sky News anyway) has been banging the war drums, promoting war in Syria. Has anyone noticed how, since the end of the Cold War, there seem to have been a lot more hot ones? And most of them started, or aggravated, by the Western powers, especially Britain and the United States. usually by intervening in other people’s civil wars. I think Tony Blair still holds the record as warmonger-in-chief — Yugoslavia 1999, Afghanistan 2002, Iraq 2003. And we are now being subjected to the same barrage of media propaganda that we were subjected to in 1999. An intervention that we were told was necessary to avert a “humanitarian disaster” actually caused a humanitarian disaster far worse than anything they claimed to be averting. And now we are hearing the same thing about “chemical weapons”. The US is already using chemical weapons in its drone strikes. Most wreapons nowadays reply on explosions caused by chemicals. The only ones that are not chemical are nuclear, and at least no one has used those yet. And the people killed in drone strikes are just as dead as those killed by any other means. Is there any way of stopping this rush to war, or at least persuading people to stop and think about it before rushing into it? I suggest there is one. I suggest that the Liberal Democratic Party of the UK holds the key. The LibDems are in coalition with the Conservative Party, whose leader, David Cameron, has been beating the war drums loudest. The LibDems and their supporters were the ones who were least enthusiastic about the Afghanistan War of 2002 and the Iraq War of 2003. So perhaps it is time for them to give notice to David Cameron that if he gets Britain involved militarily in the Syrian civil war, they will leave the coalition. Whether they have the guts to do that is another matter, but if they do, it will probably enable them to make a better showing in the next UK election than the oblivion that is likely to be their fate if they stick to the coalition to the end. So perhaps what is needed is for all Brit voters to urge their MPs, and especially all LibDem MPs, to vote against war, and if war is inevitable, to leave the coalition. Start tweeting, folks! And if Cameron pulls back from the brink, perhaps Obama will think twice. The Obama administration gave green signal to a chemical weapons attack plan in Syria that could be blamed on President Bashar al Assad’s regime and in turn, spur international military action in the devastated country, leaked documents have shown. Perhaps not the most reliable evidence, but the evidence about who the Western governments believe is responsible for the use of “chemical weapons” in Syria seems to be just as tenuous, and relies mainly on innuendo. We are reproducing herewith from Archives.org for the record the controversial Daily Mail article pertaining to a US sponsored intelligence operation to launch a chemical weapons attack on Syria and blame it on President Bashar al-Assad. From the outset, the underlying objective was to provide a justification, on “humanitarian grounds”, for a military intervention directed against Syria. Personally I think that the ‘rebels’ are responsible for the gas attack… are we on the brink of WW3?